In Music as Cultural Practice, Lawrence Kramer adapts the resources of contemporary literary theory to forge a genuinely new discourse about music. Rethinking fundamental questions of meaning and expression, he demonstrates how European music of the nineteenth century collaborates on equal terms with textual and sociocultural practices in the constitution of self and society. 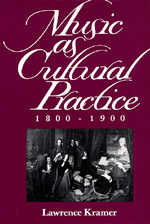 In Kramer's analysis, compositional processes usually understood in formal or emotive terms reappear as active forces in the work of cultural formation. Thus Beethoven's last piano sonata, Op. 111, forms both a realization and a critique of Romantic utopianism; Liszt's Faust Symphony takes bourgeois gender ideology into a troubled embrace; Wagner's Tristan und Isolde articulates a basic change in the cultural construction of sexuality. Through such readings, Kramer works toward the larger conclusion that nineteenth-century European music is concerned as much to challenge as to exemplify an ideology of organic unity and subjective wholeness. Anyone interested in music, literary criticism, or nineteenth-century culture will find this book pertinent and provocative. Lawrence Kramer is Professor of English and Comparative Literature at Fordham University and a composer. His Music and Poetry: The Nineteenth Century and After (1984), is available from California in paperback.